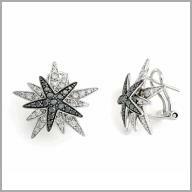 14k white gold,black and white diamonds stars earrings,0.84ct.of diamonds. Make yourself an example of up-to-date style with these twinkling diamond earrings. These button style earrings are created with polished 14K white gold and each feature 25 white & 16 blank round full cut diamonds prong set in a decorative star design. The total diamond weight is approximately 0.84ct(color: H, clarity: SI2). They have posts with omega backs.